The Charlotte 49ers men's basketball team received a commitment Sunday from one of the top rising high school seniors in the country. Following Sunday's Elite Basketball Camp on Sunday at Halton Arena, Ge-Lawn Guyn, a 6-foot-3, 165-pound combo guard from Georgetown, Ky., made a verbal commitment to join the 49ers in their 2010 class. 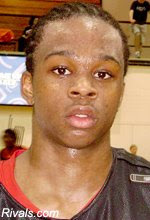 Guyn is ranked the 143rd best player in the 2010 class by recruiting web site Rivals.com and the 33rd best shooting guard. Guyn had received a scholarship offer from Western Kentucky and had also been recruited by Cincinnati, Xavier and Dayton, among others. I hope to get in contact with Guyn sometime on Monday for a more comprehensive interview. Any further word on Noel Johnson? We are stocking up on quality guards, but who is going to bang inside? Welcome to the 49er family!!! Noel committed to Clemson. We weren't going to land him based on speculation that we could free up a scholarship if he committed. Who needs to bang inside???? THREE POINTERS ALL DAY LONG BABY!!! !